At The Board Basement you will find a range of different gloves and mittens that are suitable for all weather conditions. To go for a glove or mitten depends on what you prefer. Most skiers prefer a glove so they can get a good grip around their poles, whilst most snowboarders ride with mittens to keep the warmth and comfort levels high. Mittens are generally a bit warmer as mittens trap body heat and maintain the ability to keep you warm better. If you are lucky enough to be riding some powder, a glove or mitten with a longer cuff will keep the snow out. For warmer or spring days you need something that will protect you from wind and water but with little or no insulation so you don't get to sweaty. On The Board Basement website you can use our filters to find the right suited glove / mitten for you. Most gloves come with pre curved finger construction. This will improve your performance articulation by shaping the palm pattern to fit the hand in the relaxed position, giving you an optimal fit with superior blood flow to the fingers and as a result leading to warmer hands. 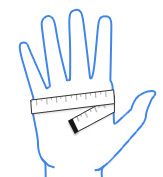 To find the right size for you; Measure around the knuckles of your hand with a tape measure and use the guides below to find your size. As you ride you will become warm and start to sweat. If that moisture can't escape from the glove / mitten your hands will become wet. Wet and cold is not a good combination. Gloves with premium leather materials such as Goat leather, Drum dyed leather are great for waterproof and breathability. Natural leather repels water, breaths and is very durable and soft so you get the ultimate in comfort and durability. You can use Nikwax to improve waterproofing and treat the leather to prolong the life of your gloves. Many leather gloves come with a sachet of Nikwax. Shell fabrics such as Corded Nylon, Polyester and Cordura are treated with a Durable Water Repellent finish to act as an initial barrier to moisture. Helping your hands to stay warm and dry. Gloves featuring Gore-tex inserts are considered to be completely waterproof and completely breathable. So if you see the Gore-tex logo you are guaranteed to stay dry. 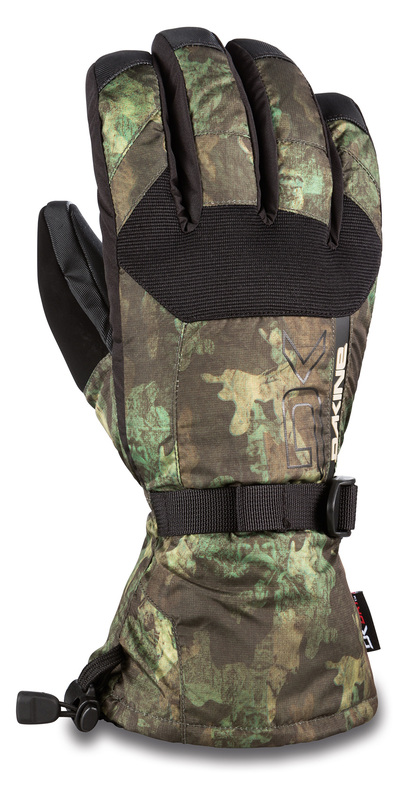 Primaloft insulation offers superior performance for high quality cold-weather gloves. Primaloft is lightweight, breathable and is proven to repel water better than any other synthetic or natural insulation, so you remain dry, warm and comfortable even under the most extreme conditions. High loft synthetic is a synthetic insulation with an excellent balance of comfort, warmth and value. It resists moisture in wet conditions, providing loft retention and an air space that holds heat and keeps hands warm. The non-bulky nature of this insulation allows breathability when conditions are warmer. Thinsulate Insulation is on of the warmest insulations on the market. Fine fibers trap body heat and maintain the ability to keep you warm. Thinsulate Insulation absorbs less than 1% of its weight in water. Even in soaking wet snow conditions, gloves or mittens with Thinsulate Insulation will retain the ability to keep you warm. Non-insulated gloves are often referred to as a Pipe & park gloves. These gloves / mittens are not very warm but great for spring conditions or during warmer days. Very Important! Only machine-wash your gloves / mittens if you really need to. Do not machine -wash leather gloves / mittens! ?Check the label on the inside of the cuff for product specific washing instructions. Zip up all zippers and attach all Velcro before loading! ?Zipper sliders and teeth can easily be damaged in the washer and/or dryer.? Velcro gets clogged up with fuzz from other garments and can snag your other clothes, causing damage to both. Gentle cycle should be all that is recommended to clean your technical outerwear. ?If your gloves are stained, you may be out of luck. Hang Dry in shade or Tumble Dry on Low Heat. Drying with excess heat can damage or melt fabric, zippers, and/or trims. Leave in until “almost dry” and change to NO HEAT or hang dry to finish.? Low heat actually helps re-activate waterproofing after washing. The Scout glove is part of Dakine's Global series of Men's Snowboard Gloves that provides the ultimate in value and comfort. The Scout Gloves feature a DK Dry Waterproof insert, so they're guaranteed to keep your hands and fingers warm and dry. And with Thermoloft Insulation and a removable liner you can say goodbye to frozen fingers forever! A great top end womens cable board with awesome graphic! The Womens Cyprus SC is here to give you Supreme Comfort. Womens version of the vulcanized jameson skate shoe. Did we say that it is super durable? It is.